T and I hit up a few parks in the Greater Boston area this weekend while visiting family up in the area. T shot a ton of photos of me riding, which was cool, cause I'm usually the one behind the lense. Saturday I rode the Winthrop Skatepark solo for a few hours and cooked in the sun and 85 degree weather. There was a local brakeless kid at the park killing it! I was blown away by a bunnyhop to brakless nose manual across a 12 foot grind box. I don't understand nose manuals...I have no balance! Sunday morning we headed out to the Tanner Skatepark at the crack of dawn due to rumors of "No Bikes Allowed" and bitter skaters enforcing the policy strictly. We arrived at the park around 7:30am and it was a ghost town. I got in a solid morning session pumping around the cement transitions and hitting up some grinds on the metal edged ledge they had. 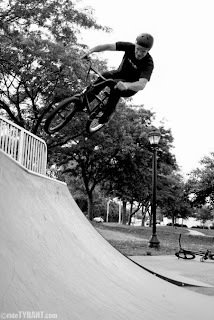 I wouldn't drive up all the way from CT just to ride that park, but when I'm in the area again I'll swing through. After Tanner we hit up the East Boston Skatepark for an hour or so. The park is in a shady location, has pretty small ramps, but there are some fun lines. T was cruising around the park and jumping the mini spines with some good speed. We stopped for a fullpipe photo shoot and some jersey barrier antics before heading back to the Winthrop Park for a bit. All in all it was a super fun Summer weekend of riding.